Crete is renowned for being a divinely sun-baked Greek Island, boasting great beaches and hot weather—but it’s less known for its spectacular White Mountains (Lefka Ori). Found in the west of the island, the mountains are a paradise for hikers and nature spotters when not dusted with snow in winter and early spring. The island of Crete is home to not one, but two mountain ranges—the White Mountains and the Psiloritis Mountains. While the island’s tallest peak, Mt. Ida (8,058 feet/2,456 meters), can be found in the Psiloritis range, the White Mountains are the tallest range on the island, with over 50 different peaks rising to 6,550 feet (2,000 meters) or higher. There are many hiking trails here—one of the most popular starts at Omalos village and crosses the famous Samaria Gorge. If hiking sounds too strenuous, you can simply enjoy the scenery by driving through the mountain passes. The White Mountains are ideal for active travelers, experienced hikers, and nature enthusiasts. Facilities are limited in the mountains, so bring a water bottle (which you can refill at rest stops), snacks, and sun protection. If hiking, make sure to wear suitable clothing and footwear. Hiking the Samaria Gorge requires a small entrance fee to enter the national park. 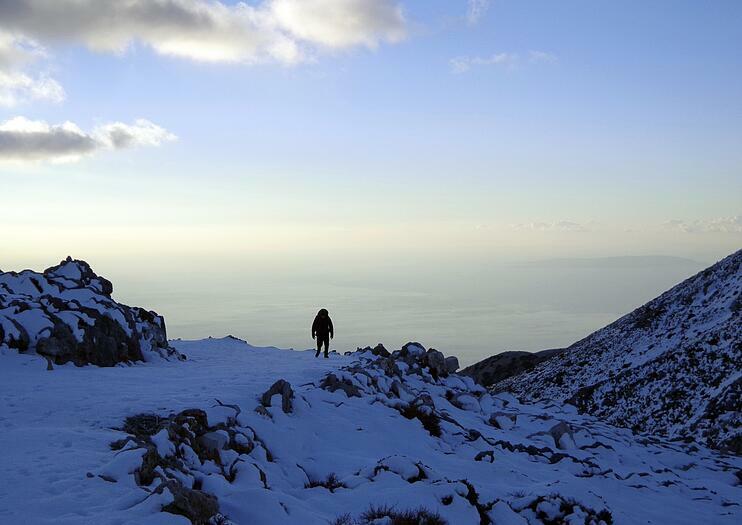 The White Mountains are located in West Crete, and many people start their hike at Omalos village. Regular bus services travel from Chania to Omalos and Samaria Gorge during the summer months, or you can drive (although you will have to return for your car the next day). Many people finish their walk through the gorge in Agia Roumeli and then take the ferry and bus back to Chania. Crete, the largest island in Greece, is accessible by plane or a ferry from the mainland. The White Mountains are covered in snow for much of the winter and early spring, and hiking by tourists is not recommended at this time of year. Samaria National Park (to access the Samaria Gorge) traditionally opens at the beginning of May and closes in October. The park is open from sunrise to sunset. With several major archeological sites, Crete is a top destination for history buffs. The Archeological Museum in Heraklion (Crete’s capital) is a good place to start for visitors who want to learn about the island’s history. The museum is famous for its Minoan artworks, but its collections cover all of the ancient civilizations that once lived on the island. Escape the tourist trail and spend a day exploring off the beaten track beauty near Georgioupolis. By traveling in a Land Rover, you’ll be able to access off-road sites that you wouldn’t discover otherwise. Visit incredible archaeological sites, traditional villages, and secluded beaches. If you work up an appetite, you won’t have to research where to eat as a delicious lunch in a family tavern is included. The tour will also take you to a winery, an olive oil factory, a castle, and multiple historical sites. Spend a day cruising around Crete’s sun-kissed coastline on this full-day boat trip. Unwind on deck and soak up the sun and island scenery as you set sail on the open waters of the Mediterranean Sea. Refresh with a swim off Almyrida Beach; explore the caves in the Drepano Cape; and make the most of free time to sunbathe, swim or snack on Greek delicacies at Marathi Beach.